Movement HONESTLY showed the billboards. On March 30, the so-called Day of silence, the movement to pay attention to the hidden agitation in Kiev in the form of billboards, reminiscent of Petro Poroshenko, Yulia Tymoshenko and Vladimir Zelensky. This is stated on the website of the public movement. “A few days ago on many billboards and citylights appeared is in the form of slogans, which contains no mention of the candidates, but stylized to their propaganda. Formally, this is not a violation of the electoral legislation”, – stated in the message. This is usually placed in the same place where the campaign of such candidate. 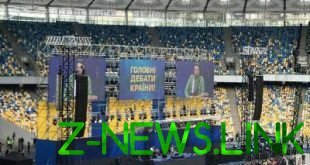 “First to change the image before the elections started at Poroshenko. Official marked is lot of Candidates – President was replaced by one made in the same style I Think, but without the output. On the same day with the President at Facebook began to spread the frames for avatars with the same slogan. Similar situation with Tymoshenko is Ukraine chooses its changes replaced made in the same style of Change, no output”, – said the expert of the Movement HONESTLY Igor Feshchenko. He believes that, most likely, this is paid not from the election funds and from unknown sources. In addition, in one of the districts of Kiev “is still possible to meet the direct campaigning of candidates, which is a violation of the electoral legislation”. We are talking about the candidate from the Freedom Ruslana Koszalinska. Campaigning does not contain the original data and placed in the unsuitable place. “This is the day of silence had to clean communal services,” – noted in the social movement. In Ukraine a day before the presidential election began the Day of silence, in which prohibited any campaigning. On this day, prohibited any election campaign, including public assessments of the activities of the candidates, meetings with voters, any campaigning in the media, as well as marches and demonstrations. The election of the President of Ukraine is scheduled for March 31. Polls will open at 8 a.m. and will close at 20:00. The right to vote are all citizens of Ukraine who at the time of the election are 18 years of age. The final list consisted of 39 candidates for the post of President of Ukraine. 31 March if no candidate attains more than 50% of votes will be appointed the second round.